There is little doubt that populism has profoundly upset the debates on thinking politics in recent times. 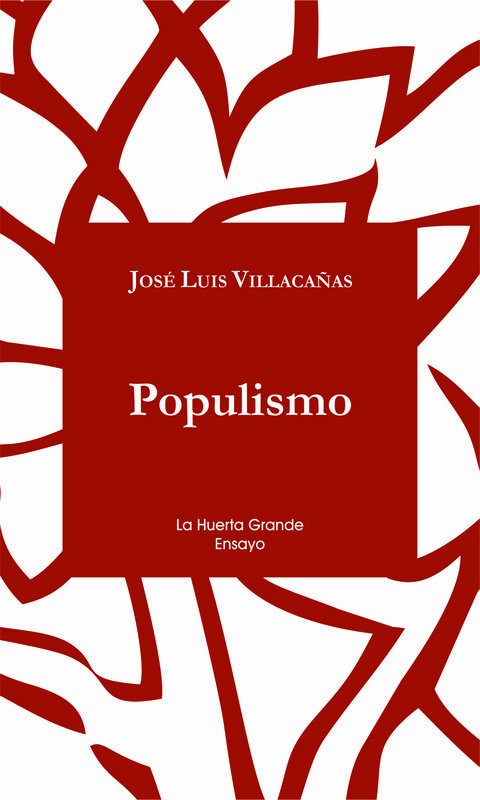 Indeed, Jose Luis Villacañas’ motto in his recent essay Populismo (La Huerta Grande, 2015) correctly captures this anxiety: “el populismo acecha”. In this brief and intelligent essay – this must be underscored, since unlike other monumental studies of his, this text is meant for a widely informed public, hence the lack of footnotes and historical reconstructions – populism is weighted with the much needed urgency that it deserves against its superficial dismissal by liberal thinkers or conventional political pundits that understand it as irrationalism or Catholicism in politics. Villacañas’ starting point is twofold. On one hand, he affirms the confusion that structures today’s international political scene; the multiple uncertainties, and unclear directions. The fact that the Democratic and Republican parties have opposing national and international agendas, attest to this indecision even within imperial reason. The reemergence of populism departs from this current predicament. On the other, Villacañas confronts Loris Zanatta’s liberal reconstruction of populism, as one that profoundly derives its consequences as a confrontation between modernization and the survival of its archaic remnants. In Zanatta’s conceptualization, populism is the outcome of an ancestral community predicated on the mystic body of Catholic representation, a formulation that seems to repeat early Schmittian theory without too many nuances. But the problem with this overarching thesis is that, although there are analogic mediations between the Pauline figure of the katechon and populist structuration, it dismisses all too easily the populist experiences in Protestant national communities, such as that of Nazi Germany or the North American democratic ‘We the people’ that runs from Abraham Lincoln to F.D. Roosevelt. “…nosotros hemos dicho que el pueblo es una comunidad construida mediante una operación hegemónica basada en el conflicto, que diferencia en el seno de una unidad nacional o estatal entre amigos/enemigos como salida a la anomia política y fundación de un nuevo orden” (Villacañas 2015, 28). The author of ¿Qué imperio? admits that he does not seek to sketch an “ideal type” of populism, if there ever was one. Instead, he offers a rough guide to interrogate more complex associations that the concept generates. In the subsequent chapters the discussion is displaced over a mapping of Ernesto Laclau’s important architectonics of populism through the reformulation of the categories of the people, the equivalence of social demands, the role of affect, the friend-enemy antinomy, the elaboration (and distortion) of Gramsci’s concept of hegemony and the intertwinement with charismatic leadership. It is important to note that Villacañas is not interested in a recapitulation of Laclau’s political trajectory, to the extent that Laclau’s On populist reason (Verso, 2006) is the culmination of a long political and militant itinerary that commences in the argentine syndicalist experience and comes to a close in the British school of cultural studies, so well studied by John Kraniauskas (2014). Opting for a different path, Villacañas situates Laclau as the symptomatic figure that condenses a series of problems in the history of the modern categories of the political since Hobbes; showing how, far from irrationality or even anti-liberalism, the author of Hegemony and Socialist Strategy is a quintessential modern political thinker at its core. There are analytical limits to Villacañas’ Laclau, which serve to ground the arguments of his essay. For example, throughout the book, there is an insistence in reading the argentine thinker in confrontation with the neoliberal epochality, as if Laclau’s theory of equivalence of demands or the catachrestic national popular springs as a response to the so-called ‘big-bang’ of global neoliberalism. A second imposed limit is the role of affect and power, which implicitly (it is not developed to its outermost consequences in the essay) has much to do with the debate on post-hegemony, which connects not only to Jon Beasley-Murray’s well known contribution of the same time, but also to the most recently published volume Poshegemonía: el final de un paradigma de la filosofía política en América Latina (ed. Castro-Orellana, Biblioteca Nueva 2015). A central gesture in Villacañas’ essay is to move away from a reductionist opposition between the “populism and post-hegemony” debate, while simultaneously drifting toward a discussion of populism beyond the concept of hegemony as identitarian production embedded in the principle of equivalence. To this end, “el populismo acecha” is not a matter of competing master tropes or schools of thought in the contemporary university where intellectual battles sometimes seem to be placed. Villacañas’ wager is that thinking populism allows for clearing the political opacity and anti-institutionalism promoted by neoliberalist machination. It in this conjuncture that populism, for Villacañas, is situated in a permanent double-bind, that is, populism is the effective response to “neoliberalism’s stealth revolution”, as Wendy Brown recently has called it; and inversely, it also coincides with neoliberalism’s drift for anti-institutionalization that fuels the anarchic principle of economic valorization at all levels of the social life. This double bind is a secondary contradiction, since Villacañas rightfully notes that populist anti-institutionalism also rests on a minimal institutional differentiation and a maximum expansion of equivalent demands. This entails that with no institutionalization; populism cannot consecrate a principle of equivalent conversion. However, with full institutionalization there is no longer any possibility for populism, since this would result in the fulfillment of all social demands withdrawing the need for charismatic personalism. Carlos de la Torre’s informative analysis of Ecuadorian Rafael Correa’s technocratic populism confirms Villacañas conceptual reflection on the convergence of populism and neoliberalism in relation to the question of institutionalization (De la Torre 2013). At the risk of an evermore-latent alliance between neoliberalism as the reactive form of government and populism as the proactive response to the crisis, we are limiting the political to nihilist circularity. Nihilism should not be understood lightly here. The question of time is implicitly located in Villacañas’ essay as what anti-institutionalization cannot account neither from the side of populism, nor from destructive hyperneoliberalism. The more we push for second one, the more the populist dessert grows. In fact, according to Villacañas, this seems to be a necessary consequence that neoliberal and liberal administrators should seriously accept. More important than the fact that the populist option does merely plays the game with neoliberalism, it obfuscates the necessity of a “third” option that would allow for a change beyond this circular temporality. The Republicanist drift affirms a post-hegemonic form of democratic politics against the neoliberal structuration of the world. It radicalizes the “minimal republicanism” that populism trims through anti-institutional time of “grand politics” (Villacañas 117). This republicanism is not manufactured on the question of personal freedoms – which is still the limit of Liberal political theory from Rawls to Nussbaum – but grounded on firm redistributive policies that, unlike populism, could transform the time of life. In this light, Villacañas understands the eruption of participatory politics in the Spanish scene (the so called “Mareas”) not as an anti-institutional equivalence of demands, but as a republicanist affirmation of deepening democratic and public institutionalization (Villacañas 124-25). This republicanist turn, unlike liberalism’s promise of redistribution, centers political life, as Hannah Arendt and Simone Weil understood so well, in the polis or citè as radical desistance from principial (State) order. Positing the polis as the minimal unit of political community, Villacañas retains the popular demand along with the always impossible pursuit of the singular. The extent to which this republicanist drift can account for the generic production of the subject is not clearly outlined in Villacañas’ essay. But Populismo (La Huerta Grande, 2015) does open productive ways for future probing and interrogations. Carlos de la Torre. “El tecnopopulismo de Rafael Correa: ¿es compatible el carisma con la tecnocracia? LARR, Vol.48 No.1 Spring 2013, pp. 24-43. John Kraniauskas. “Rhetorics of populism”. Radical Philosophy, July/August 2014. José Luis Villacañas. Populismo. Madrid: La Huerta Grande, 2015.